My son Brandon is wearing the costume, he is 11 years old. Our family loves Halloween and every year we spend lots of time trying to decide what costume we are going to create for my son. Brandon loves the ocean and this year he really wanted to be a squid or an octopus for Halloween. He also had some interest in Steampunk after watching a few steampunk maker shows and though that would be a really cool way to "spice" up an octopus costume. We decided on "King Kraken" the steampunk king of the sea. We wanted something that would stand out and loved the idea of the tentacles coming out of a top hat. This costume had two main focuses, the top hat and the staff. We started early on the tentacles for the top hat. To begin we started with EVA foam wrapped in wire, then covered in foil. Then each one was formed and shaped to resemble a tentacle. It was then wrapped and covered in orange and red material and tulle. 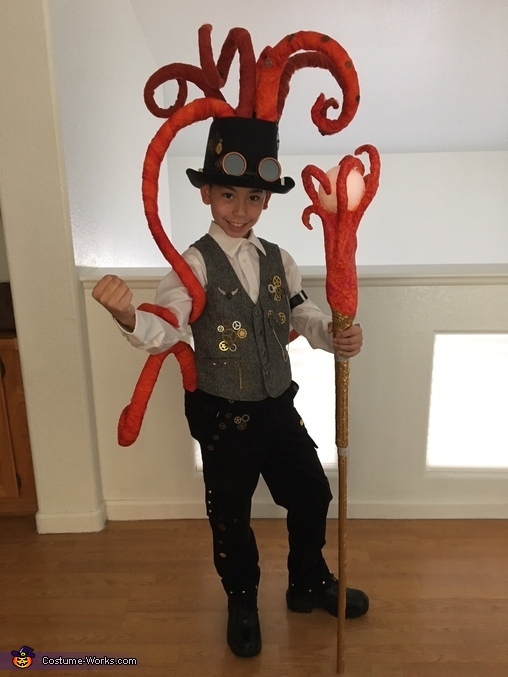 The tentacles were secured inside the top hat with hot glue after we cut out the top. Then each tentacle got gears for tentacle suckers. To the costume vest, pants and top hat we hot glued on gears, clocks, added grommets, rivets and chains. The kraken on the back of the vest is made from foil vinyl which was cut and ironed on. The light up Kraken Staff was made with a clear ornament stuffed with battery powered lights inside, painted in white. The staff tentacles are also EVA foam wrapped in wire and foil and covered in air dry clay. It was then painted in orange and red to match the tentacles. The staff itself is a wood dowel wrapped in duck tape and chain.